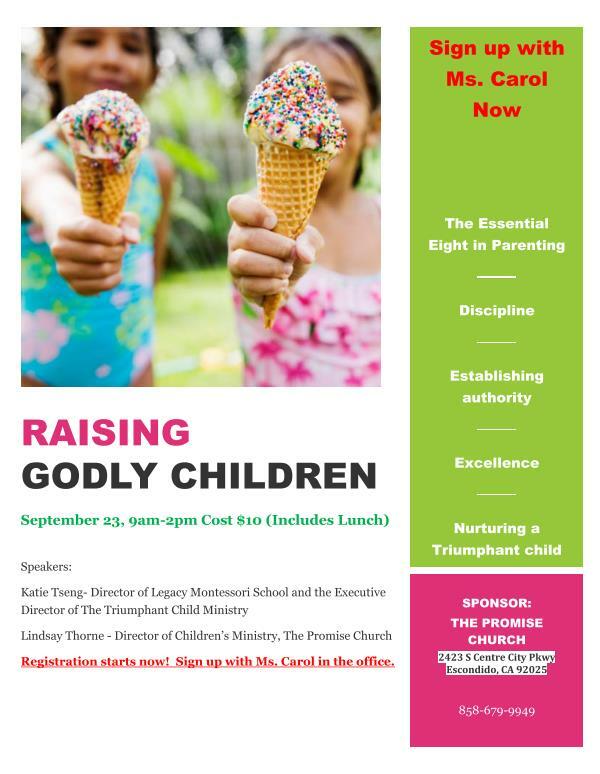 Legacy’s Director, Katie Tseng, will partner with Lindsay Thorne and The Promise Church to present Raising Godly Children Seminar. You will learn solid principles of godly parenting, including an effective approach to discipline and how to nurture character traits that are necessary for success. The way we raise our children right now has eternal impact: for our children and for the people they will influence later in life. Do you want your children to be strong and victorious, no matter their circumstances? Do you wish for them a life of joy and righteousness? Come learn how to pass this on to our future generation. Whether you think you are doing well as a parent or desperately needing help, there will be plenty of new ideas and methods for you to learn! Cost: $10 per person, includes Lunch. Make checks payable to The Promise Church. Legacy will pay half of your fee if you register by next Friday, September 15! Click on the flyer below for more details! This entry was posted in Events, Parenting, Parenting Seminar and tagged Parenting, Parenting Classes, Parenting Tips, Raising Godly Children, seminar. Bookmark the permalink.